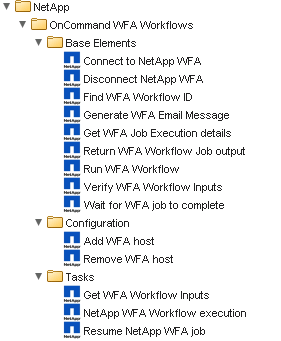 Previously we connected vCenter Orchestrator (vCO) to the NetApp Workflow Automation (WFA) database in order to perform queries against it. By itself this isn’t terribly useful when we are wanting to provide dynamically populated information to vCO workflows that are executing WFA workflows using REST. The crux of the problem we are trying to address is that when executing a WFA workflow via REST we are not able to pre-determine valid values for inputs like the cluster or storage virtual machine names. The administrator(s) can provide static values, but this is only helpful with a subset of inputs (how frequently do you add a new cluster?). For volumes, which have the potential to be added and removed frequently this would become a burdensome task quickly. One answer (there are others, which I will post about in the future) is to use the database. When a WFA workflow is executed natively (i.e. from WFA) it uses query based fields to determine those inputs. The data is populated by crafting SQL commands to pull the data form WFA’s cache database.